1In Belgium, data from the General Socio-Economic Survey 2001 reveal that 72% of commuters use a car and only 6% use the train to go to work. For commuting trips to the Brussels-Capital Region, the percentage of car users is lower, but still 63%, and the proportion of train users is significantly higher (17%) than it is for commuting in Belgium in general (Verhetsel et al., 2007). Being a major area of employment and very well served by public transport, Brussels attracts more train commuters. Nevertheless, one third of commuters who work in a company with good public transport access in the Brussels Region still use a car to go to work (CRB, 2007). Moreover, with one vehicle for less than two inhabitants, Brussels, as a city, has one of the highest motorisation rates in Europe. 2Belgium is facing huge challenges in the field of mobility which, if not tackled, will have a large impact on both the environment and the economy. In Brussels, this task is even more important than elsewhere. The goals set out in the draft Iris 2 Plan indicate that there is a growing concern about the dependence on the car and at the same time a growing recognition by the policy makers and citizens that more sustainable modes of transport should be promoted and used. According to the draft Iris 2 Plan, a particularly large number of people should be convinced to leave their car at home more often (priority 3 of the draft Iris 2 Plan: “Encourage rational automobile use”) or give it up completely. In addition, it should create the necessary conditions to do so, such as offering alternative means with a sizeable capacity, especially public transport. The draft Iris 2 Plan targets a 20% decrease in automobile traffic (in vehicles/km compared to 1999) by 2020. In the Regional Development Plan (PRD/ROP) this target is already set for the year 2010. 3Over the past decade, several Belgian cities have been experimenting with “free” public transport based on the concept of a third-party payer system to stimulate the use of public transport instead of the car. The third-party payer system implies that the price of public transport is not paid by the user or provider, but partially or completely by a third party. “Free” public transport is actually a form of revenue redistribution, which is why quotation marks are used; in the end there is always someone paying for it. The goal of this paper is to examine whether “free” public transport provision would be attractive enough to persuade more commuters to use public transport instead of the car to travel to and from the Brussels-Capital Region. To do so, it is important to investigate whether price is a key factor in the transport mode decisions of commuters. 4Research on the impact of “free” public transport for students on their travel behaviour has already revealed that “free” public transport does indeed stimulate the use of public transport, but that there are also other important factors besides price which influence travel behaviour and mode choice (De Witte et al., 2006; Macharis et al., 2006; Steenberghen et al., 2006). In this paper, the impact of “free” public transport on travel behaviour will be further investigated by exploring the case of commuters travelling to and from the Brussels-Capital Region. For this purpose, a large-scale survey has been conducted among the target population, namely commuters to and from Brussels. 5Brussels has a specific context which determines travel behaviour to and from the Brussels-Capital Region (BCR) (Hubert et al., 2009). Due to Belgium's small size, the country's linguistic particularities and the high rate of residential homeowners (which is around 70% and among the highest in Europe), the rate of daily long-distance commuters is higher than elsewhere (Montulet et al., 2008). The Brussels-Capital Region is the largest employment area in Belgium and provides employment for 650 000 people. Less than half of these jobs are held by people living in the Brussels Region, and the remainder are held by commuters, most of whom live in the Flemish Region. In total, there are more or less 360,000 people who commute to and from the Brussels-Capital Region every weekday for their work (Coppens, 2005). 6The paper begins with a description of the theoretical framework used in structuring the factors which influence commuting mode choice (section 2). In section 3, the research questions are presented. Section 4 deals with the methodology, and the results of the study are described and discussed in section 5. Finally, the conclusions are presented in section 6. 7In order to structure the factors which were focused on during the research on the potential impact of “free” public transport for commuters, we chose the same theoretical framework as that used for the research on the impact of “free” public transport for students in Brussels, namely the framework presented by Kaufmann (2002). This framework, its advantages and how it is being applied to structure the factors determining modal choice has already been described in De Witte et al. (2006), Macharis et al. (2006) and Steenberghen et al. (2006): Kaufmann (2002) analysed mobility as a broad phenomenon whereby travel depends on the fulfilment of several factors, considered as potential factors which allow an understanding of why a particular journey has or has not been undertaken. These factors constitute the travel potential of an individual, i.e. the individual’s “motility” (Kaufmann, 2002; Kaufmann et al., 2004; Flamm & Kaufmann, 2006; Canzler et al., 2008), and they can be grouped into three categories (access, skills and appropriation) (Figure 1). 8This analysis framework has the advantage of not focusing on one main explanatory factor of travel behaviour, and instead explores these types of behaviour by paying attention to a wide range of factors that influence the demand for a certain transport mode. 9Access factors are linked to the availability of different travel alternatives. They are conditioned by the location and accessibility to transportation networks of the journey's origins and destinations (Kaufmann, 2002). Besides availability, there are also financial and time issues. Several studies indicate that the demand for travel is income related (Dijst & Van Wee, 2002). There is usually a positive relationship with car use and an inverse relationship with public transport use. As incomes rise, people will buy more cars, and at the same time lower their demand for public transport. For the most part, persons with lower incomes tend to be more concerned by the price of transport (Hine & Scott, 2000). 10Prices of travel modes, and consequently travel budgets, are difficult to assess. The costs of a car are usually underestimated compared to the price of public transport for the same journey. This could be explained by the fact that only some variable costs are taken into account (mainly fuel) when assessing the price of the car (Hine & Scott, 2000; Frenay, 1994). As far as time budgets are concerned, consumers have limited time budgets and different types of people have different values of time. The motive for travelling is also important in assessing the value of travel time: the value is highest for professional journeys, lower for home-work trips and lowest for other travel motives (Dijst & Van Wee, 2002). 11Skills are developed by individuals relative to mobility and to the different means of travel. These skills can be physical, acquired or organisational. Acquired skills are linked to the knowledge users have developed of the various means of travel at their disposal and of the space in which mobility takes place. These skills facilitate the use of the considered means of travel. Skills may also result from organisational abilities developed with regard to time and space arrangements and to budget management (Kaufmann, 2002). The space/time/activity approach examines the different activities in an individual's daily life (Kaufmann: 2000). Another approach uses the notion of life conduct to investigate the everyday management of some activities that require travelling (Juan et al. : 1997; Petit: 2002; Flamm: 2004). 12Daily travel behaviour is influenced by a person’s lifecycle position and her/his lifestyle choices (Axhausen et al., 2001). The lifecycle position depends on the age of the person. Lifestyle choices include decisions on education and occupation. Higher educated people are more likely to have higher income levels and to use the car to go to work (Pickery, 2005; Dijst & Van Wee, 2002). As far as occupation is concerned, the type of work influences the use of and need for a car. Commercial functions, for instance, imply many trips during the day, making the use of a car necessary for the job. In Brussels, however, a significant number of jobs are created by public authorities and administrations which are often located near public transport stops, making the use of the car less essential. 13The influence of lifestyle choices is also related to choices which determine access to different transport alternatives, such as residential location, workplace, etc. These choices influence the development of skills concerning the different travel modes. For instance, when deciding on the residential location, the commuting mode choice is one of the factors taken into account. As such, the current commuting mode decision results from a choice made in the past. 14Appropriation is developed by taking into consideration the user’s experiences, habits, perceptions and values linked to travel modes and to space. This affects the way individuals value their own access and skills related to the different travel modes (Kaufmann, 2002). The car is usually seen as quite positive, and a dependence on the car therefore seems to arise. Such car dependency is not easily reversed. Even when income starts to decline, there is a tendency to continue using the car (Dargay, 2007). Public transport is thus assessed more negatively (Flamm, 2004; Kaufmann, 2000; Petit, 2002; Kaufmann & Bassand, 1996). 15The psychological approach of behavioural choices distinguishes two types of behaviour: reasoned and automatic behaviour (Dijst & Van Wee, 2002). In the case of reasoned behaviour, the individual makes his/her (transport) choice after carefully considering the downsides and benefits of the different alternatives. In the case of automatic behaviour, there is no consideration and the individual does what he/she usually does. This automatic behaviour occurs mostly when an individual has to deal with decisions which recur on a regular basis, such as deciding how to go to work. 16The main research questions addressed in this study are: Is there still a margin for a further modal shift? What are the obstacles that need to be overcome in order to make public transport more attractive? What are the advantages of public transport according to the commuters and how can they be exploited? And as a more extreme consideration, is “free” public transport attractive enough to make commuters shift to public transport? Or are there other important factors that influence people’s travel behaviour? 17A quantitative survey, combining paper and pencil and a face-to-face approach, was used to collect the data. The survey was tested on a pilot sample of members from the target population: people living outside Brussels who commute to the region on a regular basis to go to work. There are approximately 363 000 people who live in the Flemish and Walloon Regions who commute to the Brussels-Capital Region for working purposes (Coppens, 2005). Based on proportions of gender and age of the active population (NIS, 2002), the sample selected for the enquiry could be stratified. It is important to mention, however, that it was not a goal to be representative with respect to the travel mode. Attention is paid to two major groups: car users and train users, the latter possibly in combination with other transport modes. Within each of these two groups a representative sample was taken. 18The surveys were conducted by students during March and April 2005. These surveys were part of an assignment for their market research course. The students were instructed to use reference proportions of gender and age corresponding to the proportions of the commuting population as guidelines, but they were free to decide where they searched for respondents. Consequently, it can be expected that some of them were posted at a train station and others questioned people they encountered near their residential location, for the most part situated in Flanders. As such, the sample is rather regionally selected. The students eventually collected 1 276 valid surveys that could be used for performing analyses of commuter data: 536 of them were filled out by car commuters (Ncar = 536) and 740 by train commuters (Ntrain = 740). 19The survey contained questions on the home-work commuting trips (travel distance, travel time, transport mode, company car ownership, remunerations, reasons for using a particular transport mode, obstacles to using public transport, etc.) and on socio-demographic factors (age, gender, occupation, income level, number of cars, place of residence, etc.). With regard to the home-work commuting trips, the concept of a “principal means of transport” was used, whereby the transport mode used covered the largest distance in the commuting trip. The analysis grid provided by Kaufmann was used to categorise the factors being analysed. All statistical analyses were performed in SPSS 16.0 (SPSS inc., 2008). 20Before discussing the modal shift potential of “free” public transport, Kaufmann's motility concept will be used to structure the factors which influence the commuter’s travel decisions. 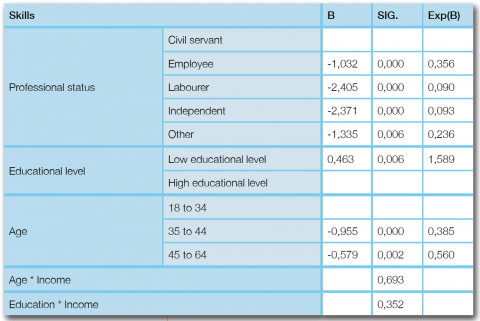 21In this research, the analysis was focused on the factors listed in table 1. The aim was to identify the variables which influence the modal choice made by commuters. As mentioned before, this study focused on two main groups: car and train users, thus ignoring the very small group of other transport mode commuters. The theoretical framework provided by Kaufmann was used to structure these factors by dividing them into three categories: access, skills and appropriation. 22In order to identify the variables which predict the commuting modal choice among these factors, binomial logistic regressions were used, as they allow an identification of the variables which predict the probability that a person will commute by car or by train. In this case, the model is formulated such that the probability of using the train for commuting is contrasted with the probability of using the car. As binomial logistic regressions can only be applied to numerical or categorical independent variables, this statistical analysis could only be used on the factors categorised under access and skills. As for the appropriation factors, the analysis is rather descriptive. 23All the access and skills factors were included in one and the same logistic regression model in order to control for all variables together. Initially, the model contained the following variables: (company) car availability, home-work distance and income as access factors, and professional status, educational level and age as skills factors. In addition, two interaction terms were also included to control for potential relations between income on the one hand, and age and education on the other hand. Only the variables with a significance level below 5% (p value < 0.05) will be retained in the model, as these are the variables that contribute significantly to predicting the odds that a person will be commuting by train or by car. 24In the next two sections, the outcome of this logistic regression will be presented and discussed. Although the access and skills factors were included in one and the same logistic regression model, for the presentation of the results it was decided that the structure provided by Kaufmann’s framework would be maintained and a distinction between access- and skills-related factors would be made. 25The access factors examined as potential factors which determine the travel mode decision of car and train users are car availability (private as well as company car), residential location in terms of home-work distance and the net income per month of the respondent. Table 2 shows the outcome of the logistic regression, with these access-related variables included in the regression model as possible predictors of the commuting mode choice. 26The first column we have to look at is the one called “SIG.”, as this indicates whether the variable contributes significantly to the modal choice. When the p value in this column is less than or equal to a level of significance of 0.05, it can be concluded that the access factor has an influence on the mode choice decision of the commuter. This seems to be the case for the number of cars in the household, the availability of a company car and the home-work distance, but not for net income. 27Next, we focus on the parameter estimates represented by B coefficients in the table. The B coefficients can vary between plus and minus infinity, with 0 indicating that the given explanatory variable does not affect the odds of choosing one transport mode or another, while positive or negative B coefficients indicate that the explanatory variable increases or decreases the odds of using the train for commuting. For instance, with regard to car availability, both variables (number of cars in the household and company car ownership) have negative B coefficients, indicating that car availability reduces the odds of commuting by train. As far as home-work distance is concerned, the B coefficients for home-work distances over 30 kilometres are positive, implying that for both distance categories (31‑60 km and > 60 km), the odds of commuting by train increase compared to the reference category of distances smaller than or equal to 30 kilometres. 28The last column Exp(B) is the odds ratio for the explanatory variable. An Exp(B) greater than 1 means that the independent variable increases the odds of train use. If Exp(B) is equal to 1, the independent variable has no effect. If Exp(B) is less than 1, then the independent variable decreases the odds of train use. For the two car availability variables, the Exp(B) value is less than 1, which means that car availability decreases the odds of train use. 29In the sample selected for this research, the majority of households have access to at least one car and many have even more than one. Car ownership is related to income but is also determined by the number of adults in the household: when adult children are still living at home, this creates a situation with multiple drivers and earners in the household. This not only results in a rise in the household income, but it also increases the need for additional cars. As income has a positive influence on car travel, these rising household incomes also lead to a higher level of car travel (Dargay, 2007). The more cars available in the household, the more likely it is that the respondent will commute by car. The analysis shows that each additional car in the household decreases the odds of using the train as a commuting mode. 30Next to the number of cars, the availability of a company car is also of significance. Having a company car influences the commuting mode choice in favour of the car. Compared to people without a company car, the odds of using the train decrease for company car owners. Company cars are actually a nearly “free” transport alternative that can also be used for private and home-work trips. These features make company car owners less inclined to use the train for commuting. 31The home-work distances are divided into three categories: distances from 0 to 30 km, distances from 31 to 60 km and distances of more than 60 km. The results show that people are more likely to commute by train when the distance between their home and work is more than 30 kilometres. This relationship is also supported by other studies, indicating that the car is the dominant transport mode for commuting distances up to 30 kilometres (Pickery, 2005). Beyond this distance, the train becomes more competitive because of its characteristic of being more cost-effective for longer distances. 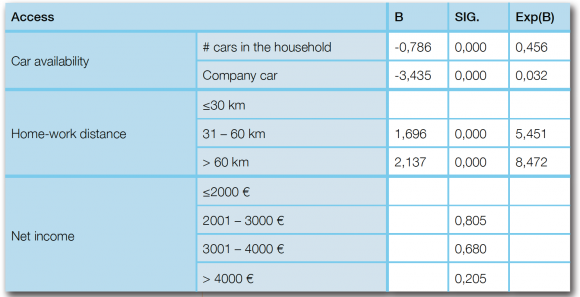 32Both car ownership and car use are related to income: as income rises it becomes easier for households to own cars, and once obtained cars are used even despite rising costs of usage. Car ownership as well as car use are more sensitive to car purchase costs than to the variable costs of car use, such as fuel prices. Car use, however, is more sensitive to changes in income and price than car ownership (Dargay, 2007; Kingham et al., 2001). However, the analyses in this research do not identify income as one of the predictors for the commuting mode choice. This may result from the fact that in most cases it is not the employee, but the employer who pays (part of) the costs related to commuting. The company’s mobility policy, and more in particular their arrangements for reimbursing commuting expenses, have an influence on the commuting mode choice of their employees. When the company provides company cars or a financial reimbursement, the employees are stimulated to use their car for commuting. When the company pursues a policy encouraging public transport, employees are more likely to commute by public transport. Within the group of car users, 27% have a company car and 48% receive a financial compensation for their car use. In the group of train users, 90% of the respondents indicate that their train subscription is completely or partially paid by the company. 33With regard to skills, the following variables were included in the logistic regression model: professional status, educational level and age. It was also verified whether education and age interact with net income by adding two interaction terms controlling for these potential relations. The outcome of the analysis is shown in table 3. Based on De Witte et al., 2008. 34The influence of lifestyle choices is among others related to the occupation of the respondent. Civil servants are more likely to commute by train compared to the other types of profession. There are two main explanations for this outcome: first, many public administrations are located near public transport facilities and second, since 2007, civil servants are able to use public transport for “free”. 35In addition to professional status, the level of education is related to lifestyle choices. This study distinguishes 2 categories: a low educational level (primary school and secondary school) and a high educational level (university short cycle (3 years) and university long cycle (5 years)). The results show that commuters who belong to the group of respondents with a low educational level are more likely to use the train than those with a high educational level. This outcome is in line with the results from other studies, which conclude that higher educated people are far more likely to commute by car (Pickery, 2005). Higher educated people in general have higher income levels and consequently also higher car ownership levels, which explains why they are more likely to use the car for their commuting trips. Although an interaction term was included to control for the interaction between education and income, it was not retained in the final model as it did not contribute significantly to improving the model (SIG. > 0.05) (table 3). 36The lifecycle position of a person can be determined by his/her age. The variable age was subdivided into three categories: the 18 to 34 year-olds, the 35 to 44 year-olds and the 45 to 64 year-olds. Compared to the youngest group, the respondents in the other categories are less likely to commute by train. This can be explained by the fact that many young people do not posses their own car immediately and by the differences in household income over the lifecycle. As the head of the household grows older, there is a pattern of increasing car ownership and car use (Dargay, 2007). With regard to age also, it was verified whether there was an interaction with income that could possibly influence the outcome of the logistic regression. This interaction term was dropped from the model as it did not contribute significantly to predicting the commuting mode choice (SIG. > 0.05) (table 3). 37Appropriation refers to what users make of the mobility options they have access to and is developed by taking into consideration the user’s experiences, habits, perceptions and values linked to the travel modes. This affects the way individuals assess their own access and skills as regards the different travel modes. The appropriation factors discussed below are experiences and habits. 38The way users have experienced travel modes will lead them to appreciate a certain travel mode and to perceive it and its attributes in a particular way. The more positive the experience and perception, the more likely the travel behaviour will not be changed. The majority of train users indicate that they are satisfied (65%) or very satisfied (10%) with the service level of the train. Nineteen percent have a neutral opinion and only 5% are not satisfied with the train services. This indicates that most respondents have quite positive experiences with using the train and are therefore likely to keep commuting by train. However, it should be mentioned that these experiences are only derived from train users and are not intended to give a general image of satisfaction with regard to the service level of the train. The opinions of car users, who might previously have been train users, are not included here. It can be expected that people who are not satisfied with the train services simply choose not to make use of it, which supports the supposition that bad experiences lead to changes in travel behaviour. 39Next to service satisfaction, the main reasons for choosing a particular travel mode may also reveal positive or negative experiences which influence the transport mode decision. Both car and train users were asked to indicate their principal reason for using this transport mode (table 4). 40Both commuter groups use positive as well as negative reasons to explain their choice. The positive reasons are linked to the travel mode they currently use and the negative ones to the other transport alternative. This may be the result of a negative experience or negative perception. A bad public transport connection is the second reason for car users to use their car; avoiding traffic jams is the most important reason for train users to use the train. It is also noteworthy that that the positive reasons are the same for car and train users: speed, price and user friendliness. As company car and cheap transport are highly ranked by car and train users respectively, it appears that price plays an important role in their transport decision: not having to pay or only having to pay for part of the transport costs because of a company car or train ticket reimbursement influences the transport decision. 41Automatic behaviour occurs mostly when an individual has to deal with decisions which recur on a regular basis, such as deciding how to commute. After a while, the commuter will be used to going to work using a certain transport mode and via a certain route. The respondent will not modify this automatic behaviour unless there is a drastic change that has a sudden positive or negative impact on his/her daily home-work transport choice. A positive impact can for example be triggered by the opening of a new road or the improvement of a train connection; a negative impact can for instance result from road blocks and traffic jams due to roadworks or public transport timetable alterations so that connections with other public transport modes are disrupted. 42The motility concept helps structuring the factors which influence the travel behaviour of commuters. The next step is to explore the potential of a modal shift from car to public transport. For this part of the research, stated preference techniques were used to elicit information on trade-offs individuals would make when confronted with particular situations (Button, 1993). Although stated preference surveys can generate stable preference estimates, there is also evidence that these preferences can be contingent on context. As a result, the behavioural intention may sometimes deviate from the actual behaviour (Fujii & Gärling, 2003). 43A survey was used to ask the commuters whether their travel behaviour would be influenced if public transport were made “free”. In this section, attention will be paid to the attractiveness of “free” public transport, the obstacles preventing car users from making a modal shift to public transport, and whether there is still a margin for this shift. 44As seen in table 5, price is perceived as an important reason when commuters are asked to indicate why they commute by car or train. Moreover, the fact that they do not have to pay the full price of their journey because of a company car or a reimbursement, has a noticeable influence on their travel choice. Since commuters appear to be sensitive to price, the question arises as to whether making public transport “free” would induce a further model shift from car to public transport. 45As table 5 indicates, there is indeed a certain willingness to switch to public transport. Moreover, the motivation tends to be influenced by company car ownership. Since they already have a “free” car at their disposal, the “free” public transport alternative is less appealing. 46Given that having a company car influences the willingness to make a modal shift, from now on a distinction will be made between company car users and private car users. 10% of the private car users point out that they would certainly switch to public transport if it were made “free”, 42% are uncertain and 48% have no intention to do so at all. With regard to company car users, 7% would definitely choose “free” public transport, 30% are uncertain and the majority of 63% would not be interested in “free” public transport. 47Nine percent of car users would be willing to make a modal shift if public transport is made “free”. What are the obstacles that need to be overcome in order to make public transport more attractive to the remaining 91%? 48Table 6 shows the five most important obstacles which prevent car users from using public transport. The main barrier appears to be the poor public transport connections. For company car users, availability comes second and speed third, and for private car users it is the other way round. To complete their top five public transport obstacles, company car users mention comfort and network, and private car users refer to timetables and public transport frequency. 49Some important obstacles still need to be overcome in order to encourage more car users to make a modal shift. When the respondents were asked if they would make a switch if the obstacles they mentioned were overcome, 22% point out that this would certainly have an impact on their transport mode choice. As table 7 shows, here again, people without a company car are easier to persuade: only 16% of company car users would make the switch in comparison with 25% of private car users. 50There is certainly still potential for modal shift from the user's point of view. Lowering the price of public transport and improving its quality are two actions that would make public transport more attractive to commuters. With regard to public transport companies, investments to improve the quality of public transport (frequency, capacity, connections, etc.) are necessary in order to provide a sustainable and efficient alternative to the car. 51Commuter traffic is very specific and causes huge traffic flows leading to severe congestion. Although public transport is very suitable for home-work transport, one third of commuters who work in a company with good public transport access in the Brussels Region use a car to go to work. The goals set out in the draft Iris 2 Plan indicate that there is a growing concern about the dependence on the car and at the same time a growing recognition by the policy makers and citizens that more sustainable modes of transport should be promoted and used. To this end, public transport should be made more attractive to current car users. Overall, there are two ways to do so: lower the price of the services and/or improve its quality. This study examined the potential attractiveness of “free” commuting by train for trips to and from Brussels. 52There are a range of factors influencing the modal choice of commuters. They can be structured into three main categories according to Kaufmann's motility concept: access, skills and appropriation. Factors such as (company) car availability, home-work distance, professional status, lifecycle position, educational level, previous experiences and habits appear to have an influence on the commuting mode choice between car and train. Income and price also have an impact, but as the majority of commuters receive a compensation for their home-work travel (be it public transport or company cars), the logistic regression does not identify income as one of the predictors which explain the modal choice between car and train. This suggests that the company’s mobility policy also has an influence on the commuting mode choice of their employees. When the company provides company cars or a financial reimbursement, employees tend to use their car for commuting. When the company pursues a policy to encourage public transport, employees are more likely to commute by public transport. 53Price plays a role in the transport mode decision, but will “free” public transport be attractive enough for car commuters to make a modal shift? Nine percent of the respondents indicate that it would. The others encounter other obstacles besides price which prevent them from using the train. The main obstacles are poor public transport connections followed by speed and availability, or even the lack of it. However, if these obstacles were removed, 22% would be willing to switch to public transport. In both cases of switching to public transport, a significant increase in the capacity of public transport would be necessary, especially during peak hours, in order to capture this modal shift potential. 54The study shows that commuters with a company car appear to be less willing to make a modal shift than those without. As such, company cars are also obstacles which prevent the use of public transport. Moreover, as they are an additional form of “free” transport available to those who receive one from their employer for both professional and private travel, they can be expected to have an impact on mobility in general. 55Despite the existence of obstacles which influence the use of public transport, it can be concluded that there is still a margin for a further modal shift from car use to public transport. In order to make public transport more attractive to car users, the price paid by the commuter should be lowered, the quality and capacity of the public services provided should be improved and the mobility policy of companies should be adjusted in favour of public transport. Furthermore, in order to encourage a large number of commuters to leave their car at home, measures aimed at making public transport more attractive should be accompanied by ways to discourage car use, such as reducing the availability of parking in Brussels. Another conclusion that can be made is related to the availability and need for data. At the moment, there are no good and recent data available on mobility in, from and to Brussels. These data are necessary in order to conduct more detailed analyses of the traffic flows in, from and to the Brussels-Capital Region and are imperative in order to establish adequate policy measures to tackle current mobility challenges in Brussels. AXHAUSEN K.W., SCOTT D.M., KONIG A., & JURGENS C., (2001), “Locations, commitments and activity spaces”. Paper presented at Survive Workshop, Bonn, Germany. CANZLER W., KAUFMANN V. & KESSELRING S., (2008), “Tracing Mobility: An Introduction”, in CANZLER W., KAUFMANN V. & KESSELRING S. (eds), Tracing Mobilities: Towards a Cosmopolitan Perspective (Aldershot: Ashgate). COPPENS H., (2005), “Vlaanderen - Wallonië: wie werkt hoe en waar?”, Over.Werk, (4), pp. 9‑16. Centrale Raad voor het Bedrijfsleven (CRB) (2007) Report: Diagnoseadvies betreffende de woon-werkverplaatsingen van de werknemers. Brussels, 30 January 2007. DARGAY J., (2007), “The effect of prices and income on car travel in the UK”, Transportation Research part A: Policy and Practice, 41, pp. 949‑960. DE WITTE A., MACHARIS C., POLAIN C., LANNOY P., VANDEWALLE S., STEENBERGHEN T., (2006), “The Impact Of ‘Free’ Public Transport: The Case Of Brussels”, Transportation Research part A: Policy and Practice, 40 (8), pp. 671‑689. DIJST M. & VAN WEE B., (2002), Verkeer en vervoer, Couthino, Bussum, 358 p.
FLAMM M., (2004), Comprendre le choix modal – les déterminants des pratiques modales et des représentations individuelles des moyens de transport. Ph.D. EPFL Lausanne, 304 p.
FLAMM M. & KAUFMANN V., (2006), “Operationalising the Concept of Motility: A Qualitative Study”, Mobilities, 1(2), pp. 167‑189. FRENAY P., (1994), “Transport de Personnes : Eléments de Choix Modal”. Réflexion pour la recherche d’un Usage Plus Sélectif de l’Automobile, Université Libre de Bruxelles – Institut d’Urbanisme et d’Aménagement du Territoire, Brussels, 41 p.
FUJII S. & GÄRLING T., (2003), “Application of attitude theory for improved predictive accuracy of stated preference methods in travel demand analysis”, Transportation Research part A: Policy and Practice, 37 (4), pp. 389‑402. HINE J. & SCOTT J., (2000), “Seamless, accessible travel: users’ views of the public transport journey and interchange”, Transport Policy, 7 (3), pp. 217‑226. JUAN S., LARGO-POIRIER A., ORAIN H. & POLTORAK J.-F., (1997), Les sentiers du quotidien : Rigidité, fluidité des espaces sociaux et trajets routiniers en ville. Paris: L’Harmattan. KAUFMANN V. & BASSAND M., (1996), “L’Automobile urbaine: une impasse”, in Voyé, L. (ed.) Ville et Transactions Sociales, L’Harmattan, Paris, pp. 29‑50. KAUFMANN V., (2002), Re-thinking Mobility: Contemporary Sociology, Aldershot, Ashgate, 118 p.
KAUFMANN V., BERGMAN M. & JOYE D., (2004), “Motility: Mobility as Capital”, International Journal of Urban and Regional Research, 28 (4), pp. 745–765. KINGHAM S., DICKINSON J. & COPSEY S., (2001), “Travelling to work: will people move out of their cars”, Transport Policy, 8 (2001), pp. 151‑160. MACHARIS C., DE WITTE A., STEENBERGHEN T., VANDEWALLE S., LANNOY P. & POLAIN C., (2006), “Impact and effectivity of ‘Free’ Public Transport measures: lessons from the case study of Brussels”. European Transport/Trasporti Europei, Special Issue on: Pricing and subsidies in transport, (32), pp. 26‑48. MONTULET B., HUYNEN P. & HUBERT M., (2008), “Belgium – A Society of Commuters”, in SCHNEIDER N.F., MEIL G. (eds. ), Mobile Living Across Europe I. Relevance and Diversity of Job-Related Mobility in Six European Countries, Opladen & Farmington Hills, Barbara Budrich Publishers, pp. 269‑304. National Institute of Statistics (NIS). 2002. Enquête naar arbeidskrachten: actieve bevolking in België volgens geslacht en leeftijd. [online]. Available at: http://www.statbel.fgov.be/port/lab_nl.asp (consulted on: 21 March 2007). PETIT J., (2002), La mobilité comme figure de l’expérience sociale: conséquences sur la caractérisation de la demande de transport, Recherche Transport Sécurité, Elsevier, Paris, (76), pp. 190‑207. PICKERY J., (2005), “Pendelgedrag en attitudes tegenover aspecten van het mobiliteitsbeleid in Vlaanderen”, in: LEMAITRE J. & PICKERY J. (eds.) Vlaanderen gepeild, Ministerie van de Vlaamse Gemeenschap, Brussels, pp. 131‑161. STEENBERGHEN T, LANNOY P. & MACHARIS C., (2006), Impact of “free” public transport on travel behaviour: a case study. Final report Scientific Support Plan for a Sustainable Development Policy (SPSDII); Part 1: Sustainable production and consumption patterns. CP/63. 100 p. January 2006. VERHETSEL A., THOMAS I. & BEELEN M., (2007), Monografie van de pendel in België, Nationaal Instituut voor de Statistiek, Brussels.